We come across a large amount of cloisonne ware at the antiques auctions we visit. We’ve even bought and sold some, but we find it’s probably the most handled and least understood antique item that potential antique collectors show any interest in. You often overhear a large number of auction go’ers speak of it as though its a ceramic, and a lot more simply pick it up and state categorically, modern, and put it straight back down on the table. So, is Cloisonne Ware Worth Collecting? 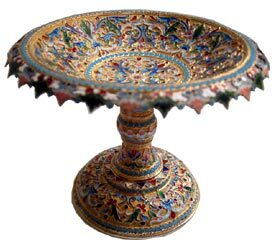 Cloisonne was first developed in the Near East. It spread to the Byzantine Empire and from there along the Silk Road to China. Chinese cloisonne is probably the most well known and is sometimes confused with Canton enamel, a similar type of enamel work that is painted, freehand, and doesn’t use partitions to separate the colors. 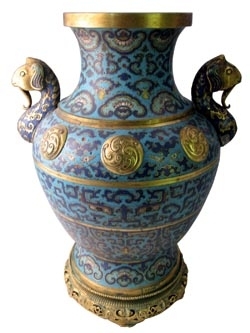 The Antique (Qianlong) Cloisonne Vase pictured was found standing in a fireside, being used as a container for fire irons. It was sold recently by UK auctioneers Potburys. It was initially catalogued as 19th century, but specialists who viewed it eventually recognised it as a rare survivor from the reign of the emperor Qianlong (1735-1795). During the auction fierce bidding between a London dealer, in the room, and one of seven bidders on the phone ended with the London Asian specialist winning the bidding contest at £31,000. However, Chinese Cloisonne ware isn’t the only collectable or desirable form of cloisonne. Russian Cloisonne from the Tsarist era is also highly prized by collectors. This unusual Russian silver and shaded enamel tazza by Ivan Saltykov, was manufactured in Moscow before 1896. It measures just 5 inches (12.75 cm) across and is approximately 4 inches (10.2 cm) tall. The top surface is decorated in scrolling enamel floral patterns against gilt grounds, bordered with turquoise pellets. The outer lip shows reticulated openwork decorated with similar shaded enamel work and it bears relevant marks to the underside, weighs 8.14 oz (231 grams) and was being offered for sale at $14,000. If you take the time and learn to recognise the antique from the modern, then there are excellent pieces out there for you to discover. Cloisonne popularity is growing but it could still be a profitable niche for antiques collectors.